Skiing a bad, old or non-existent gear tune can be the difference between a good day and an edge-catching, ice-skating, snow-grabbing bummer of a day on the slopes. In the ski racing realm, it’s the difference between the podium and everyone else, according to the folks at Denver Sports Lab—a performance tune shop at the crux of where Golden meets I-70. 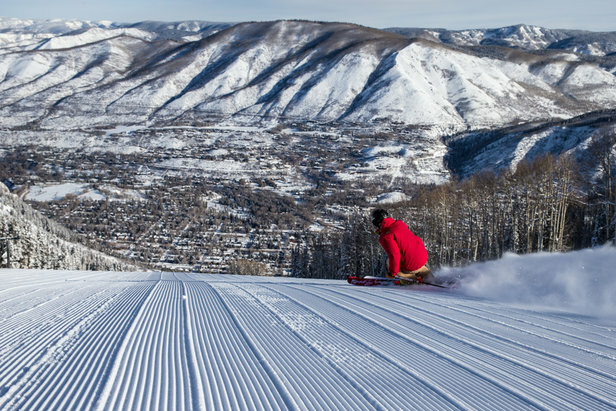 Even though they exist in a veritable ski traffic mecca, many Colorado skiers and visitors probably haven’t heard of these guys. That’s by design. Denver Sports Lab proprietors Leif Sunde and Sam Petty like to keep it mellow, for now at least, so that they can keep it consistent. 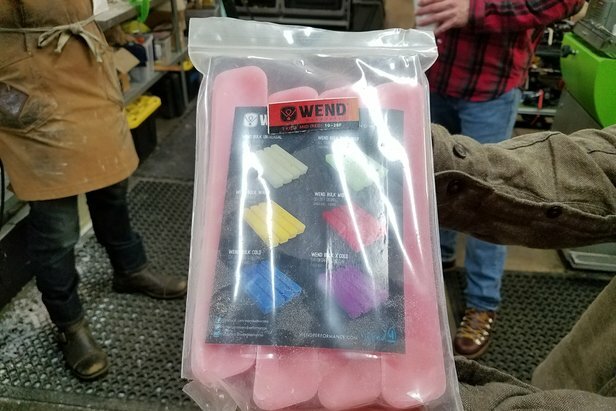 Be it uniformity in your ski’s base, evenness along the edges, a process that one shop tech can easily pick up where the other left off or reliability when it comes to turnaround time—two days, regardless of season or workload (for rush jobs, bring beer)—consistency comes up again and again as priority. Accordingly, “the only belt you’ll find in here is around my waist,” says Sunde, referring to their exclusive use of stone grinding for, you guessed it, consistency’s sake. All of this is just in an effort to take “the equipment variable out of the skiing experience,” according to the team. 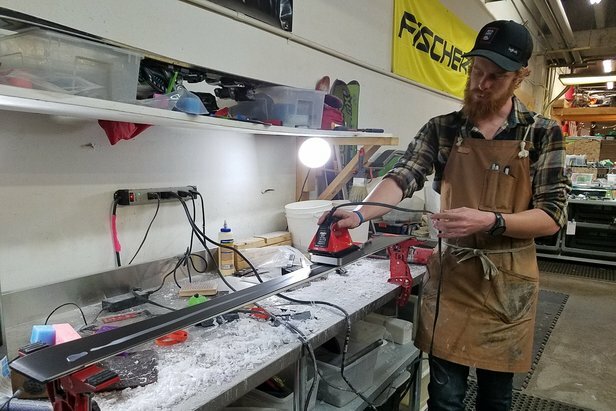 Though their focus is quality, Sunde and Petty are also capable of quantity, regularly servicing race teams and achieving a shop record of 68 pairs of skis in one shift. Sam Petty performs an initial inspection on my ski to determine whether the base is flat. Spoiler alert, it's not! • Dry your equipment after every use to avoid rust and corrosion. "THIS IS EXPONENTIALLY IMPORTANT IF YOU USE A ROOF RACK AND YOUR GEAR GETS COVERED IN ROAD MUCK!" shouts Sunde via email of this essential upkeep. • Wax your skis/board every 4-6 days. Another barometer: you should be ironing in about four bars, or a kilo of wax, per ski season. • "Edges can and should be maintained each day of riding with a diamond file, think of it like honing a kitchen knife," advises Sunde, who adds that beyond that, actual sharpening, either with a file at home or through the shop, should be about the same cadence as waxing. • A full base grind is recommended after the first 5-8 days on a newly purchased pair of skis to give it time for the epoxy to settle. This process actually planes a small layer of base off the ski and can therefore only be done up to six times over the life of the ski. The timing for this service is "truly just based on the professional assessment of the equipment," Sunde says. "How flat is the base, is there significant damage or beyond normal wear and tear? This is definitely on an 'as needed' basis, not so much on a specified cadence or cycle." However infrequent, the process of flattening out the base of your skis is absolutely critical for proper edge engagement. "If the base is concave, the edges will behave too sharp, and you'll catch your edges all the time. Conversely, if the base is convex, the edge will behave as though it is too dull, and you will struggle to ever really engage your edge," according to Sunde. • Storage wax at the end of the ski season will help keep the bases protected from oxidation. 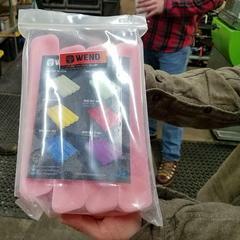 This is the amount of wax your skis need per ski season. 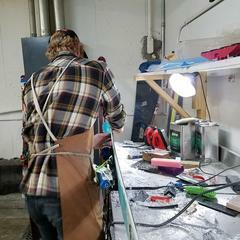 If you’ve ever been curious about the goings on behind the scenes where those busy little shop elves disappear to with your skis only to return 2-14 days later with any number of real or implied tune services, Petty and Sunde host clinics to walk skiers and riders through the process. In fact, participation in your own tune is encouraged at Denver Sports Lab, just be prepared to learn way more than you bargained for. Forget shop elves, this is Geppetto status. 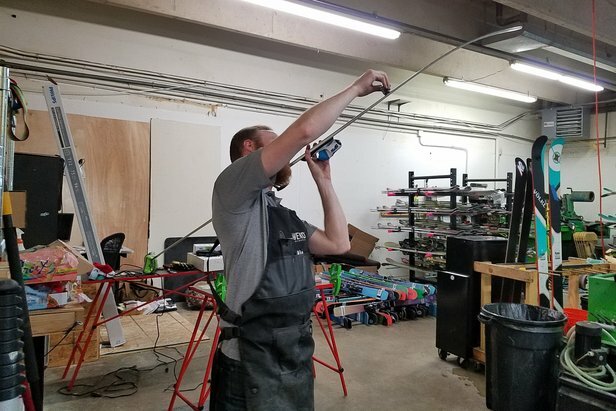 These guys geek out on ski tuning… hard, with more than a few entertaining anecdotes to share—like the intensely repetitive and precise tuning regimen the skis of a Lindsey Vonn or a Mikaela Shiffrin go through before they click in for a race (something like 15 rounds of wax between 36 runs). During our clinic, we learned about the spectrum of course to fine files that can be used to hand-smooth edges, we did some sidewall planning and talked bevel setting, and we waxed in a slow, consistent and straight line from tip to tail. There may have been a few cold snacks consumed, and some of us had a harder time than others focusing when the shop dogs, Izze and Atlas, came looking for love. 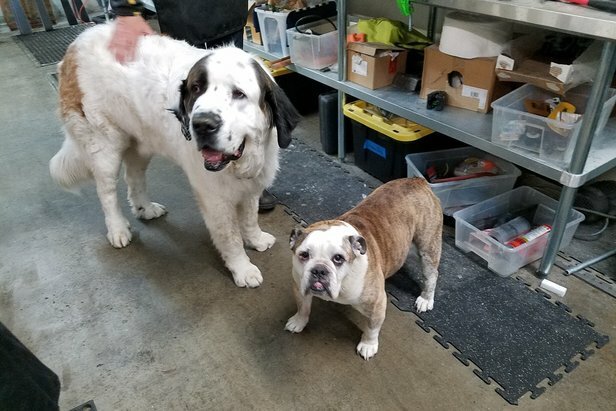 When the shop dogs come around for love, they're pretty hard to ignore. There’s certainly something to be said for teaching a man to fish, but in this woman’s case, ski tuning just happens to be one of those topics where the more you learn, the wider the chasm between what you now know and what you realize there is to know. Not to mention the overwhelming amount of gear you could get yourself into diving down the rabbit hole of home tuning. It was a blast, but I’ll be leaving my ski tunage to these pros. 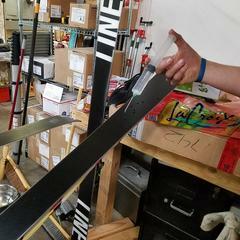 Had I come away more competent and confident I wouldn’t do my skis more damage than good, I’d be able to score said tuning gear, amateur to commercial, from Denver Sports Lab. 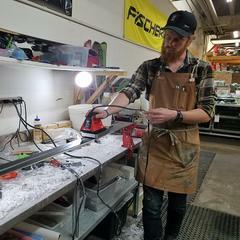 In addition to getting your tuning routine dialed, the shop can also equip skiers with ski boots, boot fitting, race skis and even custom ski orders in some cases. Petty and Sunde also serve as a ski tune knowledge epicenter of sorts, inviting skiers and riders with concerns about a questionable tune from elsewhere to come see them so they can make it right.